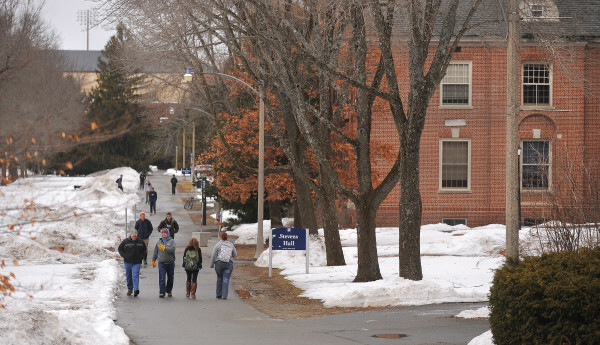 Students walk across campus at the University of Maine in Orono in this March 2014 BDN file photo. BANGOR, Maine — Overall enrollment at the University of Maine System is down about 1.3 percent from this point last year, with the drop in students occurring primarily at the largest campuses, according to the latest figures released last week. Four of the seven UMS campuses — Farmington, Fort Kent, Presque Isle and Augusta — saw increases in total students, according to the system enrollment report. The flagship campus in Orono, the University of Southern Maine and the University of Maine at Machias attracted fewer students. System officials have reported declining enrollments for years, and attribute some of the trend to the shrinking number of young people in Maine. Although numbers from the Orono campus reveal a 2 percent decline in enrollment, that doesn’t necessarily mean finances will suffer. There are 433 fewer students from in-state studying at the University of Maine than there were at this time last year, a 5 percent decrease, according to enrollment numbers. Overall enrollment, however, is only down about 2 percent because there’s been a 7 percent increase in the number of students from out-of-state. Of the 10,865 students in the university’s headcount this year, 3,151 are from away. “There’s only so many students in Maine that you can draw,” Joel Wincowski, vice president for enrollment management at UMaine, said. So, in recent years, UMaine has launched “targeted pushes” outside its borders to attract students from away, who pay higher tuition than a student whose family lives in — and pays taxes in — Maine. A Maine resident pays $8,370 in tuition to attend the university. Room and board and fees bring that to just over $20,000 per year. Out-of-state students pay $25,740 in tuition. Add room and board and fees, it comes to about $37,400 per year. Qualified students from New England states and Canada get a reduced rate, paying $12,570 tuition. The in-state tuition rate has stayed the same since 2011, part of the system’s effort to keep college affordable for Maine students by resisting the national trend of increasing tuition costs to combat declining revenue. That commitment also has made it more difficult to bring in money. In recent years, UMaine has worked more to promote itself across New England, as well as in New York, New Jersey and Mid-Atlantic states, Wincowski said. That includes marketing, mailers, displays and booths at college fairs. UMaine also targeted more than 1,000 out-of-state high schools. That’s shown some results, Wincowski said. For example, UMaine received about 1,400 inquiries in 2014 from New Jersey students interested in receiving more information before applying to attend UMaine. This year, those inquiries have already hit 3,500. “We are going to grow, and we are going to be more selective as we go,” Wincowski said. The University of Southern Maine, the second-largest campus in the state, struggled to retain students from last year, suffering a 7.5 percent drop in its overall headcount — from 8,133 last year to 7,527 this year. A tumultuous 2014, in which university officials cut 51 faculty positions and eliminated several programs in an effort to avoid financial pitfalls, prompted some students to transfer because their programs no longer existed or to get away from the unrest. The university doesn’t have an exact count on how many students it lost because of the cuts, but they likely were a significant contributor to the reduced headcount. The difficulties also likely convinced potential students not to apply. Those factors, combined with the fact that a large class graduated in the spring, resulted in the decline from last year. Now, USM is working to repair the damage with efforts to improve its retention of students by offering increased financial aid and better one-on-one financial aid services to students. The University of Maine at Machias, the system’s smallest campus and the third campus to report a smaller enrollment this year, reports a headcount of just under 800 students. That’s a 3 percent reduction from last year. The University of Maine at Augusta remained relatively flat in terms of number of students, at 4,558. But it brought in 41 more out-of-state students, a 27 percent increase over last year. The University of Maine at Farmington increased its rolls by more than 3 percent, taking in a total of 65 more students than it did last year. “After a few years of downward trending incoming class sizes, we had a bump this year,” Jared Cash, the school’s new vice president for enrollment, said. This year, UMF drew a 567-member incoming class of first-years and transfers, up about 10 percent from last year. The incoming class in 2014 was a historic low for UMF, according to President Kathryn Foster. Prior to 2011, the school consistently brought in classes of more than 600 students. In 2012, new enrollments dipped under 600. By the close of the last school year, the size of the newest UMF class fell to 500. In order to recover from a disappointing 2014, the school changed its enrollment leadership, changed marketing materials and dropped its $40 application fee. As a result, applications surged above 2,000. The western Maine campus prides itself on its public liberal arts education. UMF has a reputation as a teaching school — in part because of its history as a normal school and five of the past seven Maine Teacher of the Year Award winners were UMF graduates. It also offers programs in psychology, geography, history, business and other fields. The school also touts its proximity to Maine’s ski slopes and outdoors recreation hubs. In an effort to continue to grow its enrollment, the school is trying to push its retention rate from about 75 percent to 80 percent. That’s a common goal among all universities in the system. Foster said keeping incoming classes at around 540 students is financially sustainable, as long as retention rates are strong. At the universities in Fort Kent and Presque Isle, enrollment numbers are up 19 and 12 percent, respectively, but that’s largely because the schools have welcomed hundreds of area high schoolers who will be taking early college courses for credit. Those students are included in headcount and credit hour counts, though they aren’t traditional full-time students. The cost for a student enrolled in a course through the AP4All program, meant to help rural students earn college credit while in high school, is around $280, according to the Maine Department of Education. “We’re breaking down the barriers and separation that has existed between high schools and colleges,” UMPI President Linda Schott said.